PLYMOUTH, Mich. – USA Hockey announced today the 22 players who will compete as the U.S. National Under-18 Team in an Under-18 Five Nations Tournament that begins tomorrow and runs through Sunday (Nov. 11) in Kravaře, Czech Republic. Along with the U.S., other participating nations include the Czech Republic, Finland, Sweden and Switzerland. The roster includes 20 full-time members of the 2018-19 U.S. National Under-18 Team, part of USA Hockey’s National Team Development Program. Additions to the roster include forward Robert Mastrosimone (East Islip, N.Y./Chicago Steel) and defenseman Cade Webber (Meadville, Pa./The Rivers School). 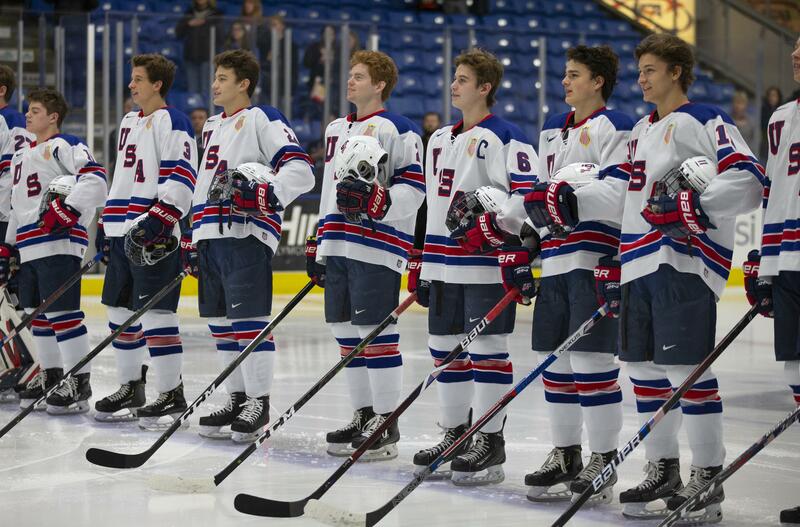 "We're excited about our roster," said John Wroblewski (Neenah, Wis.), head coach of the U.S. National Under-18 Team. "We know we have a group of players that will represent our country well on the international stage." The U.S. will open tournament play against Sweden at 9 a.m. EST on Wednesday (Nov. 7). Team USA is also set to face the Czech Republic (Nov. 8), Switzerland (Nov. 9) and Finland (Nov. 11). NOTES: All games from the Under-18 Five Nations Tournament will be available via livestream here ... The official tournament website can be found here ... Team USA's home page for the tournament can be accessed here ... Follow @USAHockeyNTDP on Twitter for tournament updates and join the conversation on social media by using #5NationsU18 ... Wroblewski will lead the U.S. National Under-18 Team alongside associate coach Dan Hinote (Elk River, Minn.), intern assistant coach Kevin Lind (Homer Glen, Ill.) and director of player personnel Kevin Reiter (Pittsburgh, Pa.).